This blog post is occasioned by the National Council of Rural Advisers' consultation on Rural Economic Strategy. It isn't directly a response to that consultation, but I'm writing it to help formulate my thoughts in order to respond. A lot of the figures in this piece come out of my Minimum Viable Village Model. In this essay as in other essays I treat it as axiomatic that the economy should serve the people, not the people the economy. I also treat it as axiomatic that a settled landscape is a good thing in itself. I'm not going to argue those propositions; if you disagree with either of them, then you will disagree with my argument and my conclusions, and that's just how it is. There are a number of key problems with Scotland's rural economy. The first is population density. It takes about 270 adults of working age to produce enough children to maintain a viable primary school. Currently, average agricultural holding size in Scotland is 101 Ha and rising; increasingly, those holdings are each providing only one income. That means, given coast, forestry, and unfarmable land, there are about 40 holdings and consequently about 40 farm incomes in a 5Km travel-to-school radius. Consequently, to sustain a viable village school you need about 200 non-agricultural incomes per village, and those incomes must be within a viable travel to work radius. You also need affordable housing for 270 adults per village. Typically, in rural Scotland, wage rates are depressed, while housing costs are inflated by people from outwith the rural economy buying retirement and holiday homes. This is just another example of the fact that capitalism simply doesn't work for people, and that we spend an awful lot of time and effort working around the manifest failings of capitalism to produce an economy which supports the many. What the Scottish rural economy needs is full communism now, but we aren't going to get that, so we need to keep on tinkering with the margins of a broken economy. But one thing we can tinker with is planning law. 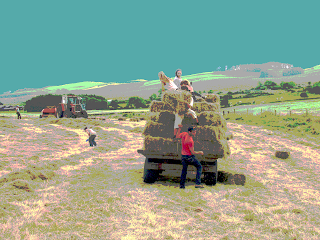 If people are going to live in the landscape, on the depressed wages which are probably inevitable in rural areas, then they need to leverage the advantages of rurality to make their lives viable and fulfilling, and that means they need land - to grow food for themselves, reducing their costs, and to increase their amenity. They also need housing that they can afford, and which is not subject to 'market forces'. Which means, essentially, they need housing which cannot be traded on the open market. And they need non-farm economic opportunities, which means we need more rural workplaces. Planning policy over my lifetime has been hostile to 'sporadic development', and very hostile to village industry. Houses have been huddled together in ever expending villages of urban density, while industry has been pushed to the outskirts of far-away towns. That won't do. The Internet does allow far more folk to work from home, but rural areas typically have the worst Internet connections. In any case, people go to work (among other things) for social contact; and Scotland needs engineering production at least as much as it needs jobs that can be done in front of a screen. But for both these things - if we are to support a peopled landscape - we need the work where the people are, and if we want the people distributed across the landscape, then so must the work be. So: we need smaller holding sizes, not larger ones, to put more folk on the land. We need sporadic development in the countryside, because people need to live on the land they manage We need more workplaces, because smaller holdings won't necessarily provide full incomes, and in any case agriculture will only employ 20% of the population we need to sustain. And we need the workplaces where we want the people to be, which means sporadically, in the landscape. But we don't need those sporadic homes bought up by the rich retired, or the even richer second home buyer. We need them lived in by the people of the place; people who will at some stage in their lives, have children for the school. People embedded in the landscape, who are intimate with it, who know it and care for it, and are committed to it in the long term. For all those reasons I think these houses we need should not be privately owned. They should be community owned, and let to members of the community on a life rental - a tenancy which is secure for the whole of the tenants' lifetime, but which is not transferrable or heritable. People need security; but inherited wealth is the key driver of social inequality, and, in any case, that which can be inherited can very often also be sold. As I said at the beginning of this piece, what the Scottish rural economy needs is full communism now.